At our February meeting we were introduced to the fascinating topic of archeological dowsing, a subject with which the majority of the audience were completely unfamiliar. Dowsing was defined for us as 'a structured way to access the sixth sense' and we were told that science cannot explain it. 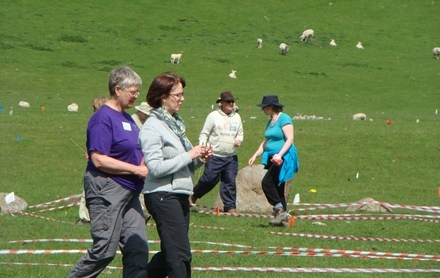 Dowsers use an angle rod or a pendulum and the technique has been used to find both roman and medieval buildings, including locally at Woodchester. Finds are flagged and their position mapped with GPS. Dowsing can be successful through solid surfaces and at any depth. It may have been a dowser who found the body of Richard III in Leicester. In April 1982, most people in Britain had to get out an atlas to discover where the Falkland Islands were when the Argentinians invaded and Britain went to war to restore British rule successfully. Paul and Ros Thomas had no such need when they visited the islands recently to see their son, Daniel who was serving out there and to look at the windswept scenery as well as the special wildlife. Paul explained that the capital, Stanley, was founded in 1845 and for many years, there was a thriving fur trade. The islands are very isolated and have the same latitude South as London in the North. The population is around 3,000 and the main industries are sheep, tourism and fishing. He gave a quick resumé of the 1982 conflict and we were shown pictures of several poignant memorials for those killed in the battle. The islands now have a considerable military presence near Stanley. To travel any distance around the islands, journeys are made by plane or helicopter and if travelling by road, only 4x4s are used. Paul and Ros flew to Saunders Island, Volunteer Point and Sea Lion Island – all remote areas, to view the fascinating wild life. We felt part of a David Attenbrough documentary as we saw pictures of king,gemtoo, magellanic and rock hopper penguins, as well as albatross, turkey vultures and elephant seals. It was obviously a trip of a lifetime for them both and one we felt privileged to share during the illustrated talk. We welcomed Rodney Veazey for our December talk and were enthralled by this fascinating lecture which was accompanied by Rodney and Felicity’s superb photographs taken on their travels researching these magnificent creatures. Their most recent visit was to the Azores. The lecture began with an explanation of the evolution of whales which are descendents of land-dwelling animals, they evolved from herbivore to carnivore and they first took to the sea approximately 54 million years ago, their features becoming adapted for life in the marine environment. They are able to dive deeply into the ocean and hold their breath for an exceptional length of time. 15 miles away and the Blue Whale is the largest creature to have ever lived on our planet. Each species of whale is individual with differences such as vocalisation and eating habits. Much research has been done over the last 25 years and MRI scans have been undertaken on dead whales which have enabled much more to be learnt about their anatomy. Rodney is passionate about the charity WDCS (Whale and Dolphin Conservation Society) which is based in Chippenham but has offices worldwide. Whales face many dangers which include shipping and also commercial hunting. Whales are known to be sociable but the subject of captivity for public display is controversial. The evening ended with the members and visitors enjoying the delicious mince pies made by Pat Davies. Fifty members, some brave arachnophobes, attended the Methodist Hall for our November meeting to listen to Bill Blumson of the Wiltshire Wildlife Trust talk about the spiders we find in our homes and gardens. Did you know that there are 680 species of spiders in the UK of which 300 are money spiders and seven are house spiders? As there are so many only a few have common names. Do they bite? Yes but the majority don't have strong enough jaws to penetrate human skin. The false widow spider does bite but only if squashed and fortunately the venom doesn't affect us. Do the females eat the males after mating? Not all of them do. Some live side by side in the same web. We also learnt that some female spiders are very maternal, carrying their young in a sac on their backs. On the other hand, the log wood spider guards her egg sac for three days after the young have hatched while they survive on the egg sac, then they eat the mother which would have died anyway. They have either six or eight eyes. Some hunt using sight, whereas those which can barely distinguish day and night and live in burrows hunt using touch. What happens when you or your partner removes a spider from your house and puts it out in the garden? It won't survive. We should really welcome them into our homes as they do no harm and control the fly population which spreads germs and diseases. After his talk Bill was bombarded with questions which continued informally during coffee. He showed some pictures of webs, explaining that different web designs suited the hunting habits of different species. Perhaps the subject of a future talk.